The term ‘an old head on young shoulders’ could have been created for Cobblers teenager Jay Williams. The 18-year-old has been the silver lining around a dreary cloud for Town’s frustrated followers this season, with his emergence as a first-team regular a genuine cause for celebration and optimism. The Northampton-born player is at the forefront of the new breed of Cobblers youngsters who are emerging from the club’s academy system and pushing to establish themselves in the first-team picture. Midfielder Shaun McWilliams, who is now 20, paved the way a couple of years ago and now the next batch are coming through. Fellow teenagers Morgan Roberts, Sean Whaler, Scott Pollock and Camron McWilliams have all played for the first team fleetingly this season, and others are in the wings. But the unflappable Williams is undoubtedly the cream of the crop. Indeed, it would be no exaggeration at this moment in time to say the former Kingsthorpe Commnity College student is currently one of the first names on manager Keith Curle’s team sheet every week. Williams has started every game since making his full Football League debut against Forest Green Rovers on New Year’s Day, and has been one of the team’s best performers. Whether it be at the heart of defence, or in central midfield, Williams has an assurance and confidence way beyond his tender years. It has been a personal triumph for the player who looks so calm when on the pitch, and it turns out he is just as unfazed when faced with questions from the media, making it clear the only thing that matters is the team. “It has not been the best of seasons for the club,” admitted Williams, who joined the Cobblers academy at the age of 13 after being released from Coventry City. “Personally it has been good and I have been getting my opportunities and stuff, but I would rather the club was doing better. If Williams keeps performing as he has been, then the team will also be heading in the right direction, and it could yet be that he is joined more regularly in the first team by some of his colleagues from a Town youth team that has been unstoppable this season. They won their league at a canter, and also reached the third round of the FA Youth Cup, where they impressed in a narrow 2-0 defeat at Arsenal. So what is the secret of the Cobblers academy’s success in recent years? Williams says former academy head Trevor Gould, who retired in September, as well as Under-18s boss Jon Brady have to take a lot of the credit. “I think, even coming from under-16s when I was a first year, with Trevor Gould and Jon Brady, they install the first-team mentality into you,” said Williams. “It was a case of, we don’t play silly football, we play how you play in the first team, so you are ready when you get into the first team to play that way. “When you are going through the process of the academy, it all goes very quickly. “The next day, then the next day, and every training session you do the best you can. “Luckily for me it has all worked out, and I have got where I am. “It has all come to fruition at the start of this season. 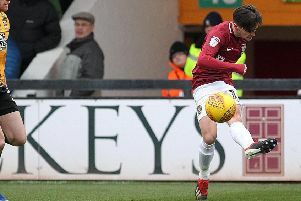 When he has played for the Cobblers, Williams has shown real composure on the ball - although he does admit his calmness did at times get him in a bit of trouble. “Trevor used to have a go at me for taking too many touches at the back at times!” admitted the former Delapre Dragons player, who added that he has found it fairly easy to be as relaxed as possible when he is in the first team. “Yeah, it doesn’t really faze me a lot when I am in front of a big crowd,” he said. Williams knows he is only starting out and that he has a lot to learn and improve on, with his physicality right at the top of the list. The youngster has more than held his own when it comes to the rough and tumble of league two so far. Against Morecambe last weekend, Shrimps striker Richie Bennet clearly targeted Williams in an attempt to unsettle him, but the youngster more than stood his ground. That said, he knows he has to beef up. “I am only 18 still, but I am going to the gym every day and I do have a plan, because I need to get bigger,” said Williams. “I know that, I know where my faults are and what I am good at, and I am just going to keep working hard, get bigger, get stronger and get better at the things I am not too good at. “The physical side of things is part of the game and you have to get used to it. “Saturday was only my 11th match in, and it will come with experience. Williams has looked equally as effective in midfield as he has in central defence, with Curle happy to deploy him in either position. But where does the players himself feel he should be utilised? “I have played centre-half my whole life, growing up and coming through the academy,” said Williams, who only signed his first professional contract with the club last month. “I think I feel more comfortable in there, but if the gaffer wants me in midfield then I will do the best I can for him and the team. “Every opportunity I get I will try and play as well as I can, and hopefully keep my place in the team. Something that must be reassuring for Williams, and also the other youth team prospects is the fact there are so many of them around the first team squad! Waiting to speak to Williams at Moulton on Tuesday, I was passed by Camron McWilliams, Roberts, Pollock and Whaler, who were all on their way to first team training. All of them teenagers, with all of them having come through the ranks. “It is good having so many around, because you come in and you know them,” said Williams. “Even when there are new people that might come in from the youth team, then they know us. Williams has had the answer to every question asked of him in his short footballin career to date. His next test will come on Saturday when Colchester United come to the PTS Academy Stadium, and the youngster is ready for it. “I know they have lost their last two games, and every team in this league is beatable,” said Williams, who will be hoping he will continue at the heart of the Cobblers defence.